1. Apply salt on the baby corn. Keep aside for 8 minutes. Drain out the excess water. 2. Make a thick batter using the flour, cornflour, buttermilk, chilli powder, garlic paste, soda bi-carb and salt (using a little water if required). 3. 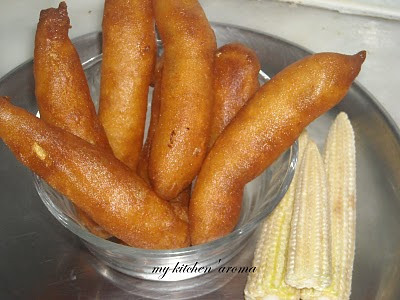 Dip the baby corn in this batter and deep fry in hot oil till golden brown in colour. 4. Drain on absorbent paper. Serve hot with hot sauce or tomato sauce. Wow wish i could jus tpick few looks so crsipy delcious. never done corn like this. Delicous idea. Perfect snack item... nice clicks!! Yours is more perfect . Wow, so create Varunavi !!! What a wonderful n a simple treat. It would be perfect with tea. 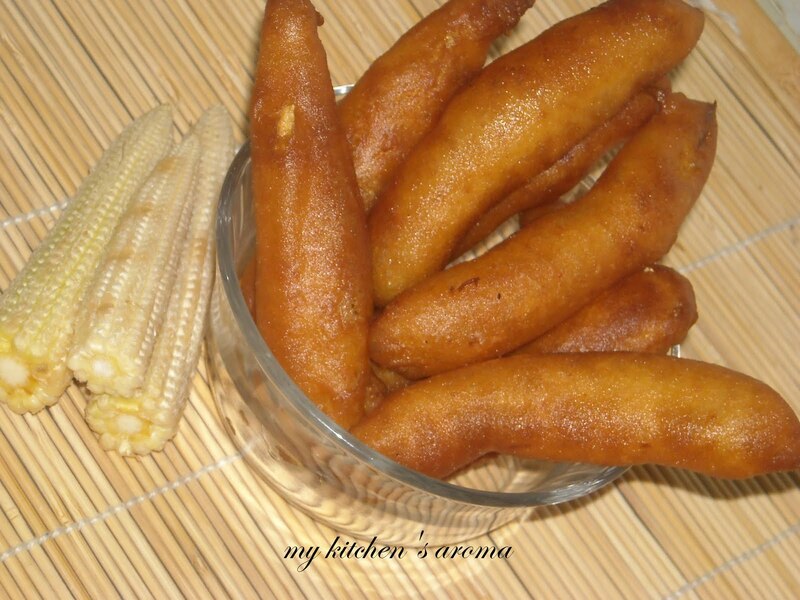 I have been wanting to do baby corn fritters for a while now.Inviting click varunavi. Never tried making fritters with babycorns, looks superb delicious..
Wow, its been so long since I have seen baby corn. We dont get them here. I love baby corn, Varunavi and I am also happy that you have come out with something ' vegetarian' so that I can ask my wife to immediately make. She calls it 'ghass phoos.' I am the only veggie at home. Wow! Nice awesome fritters! It looks wonderful! This is good for a rainy day! Love baby corn fritter! Looks soooo delicious! Thanks 4 dropping in & 4 ur kind words !! Loved the Babycorn snack !! perfect with a cup of Tea ! Crispy and crunchy fritters. Love it so much.